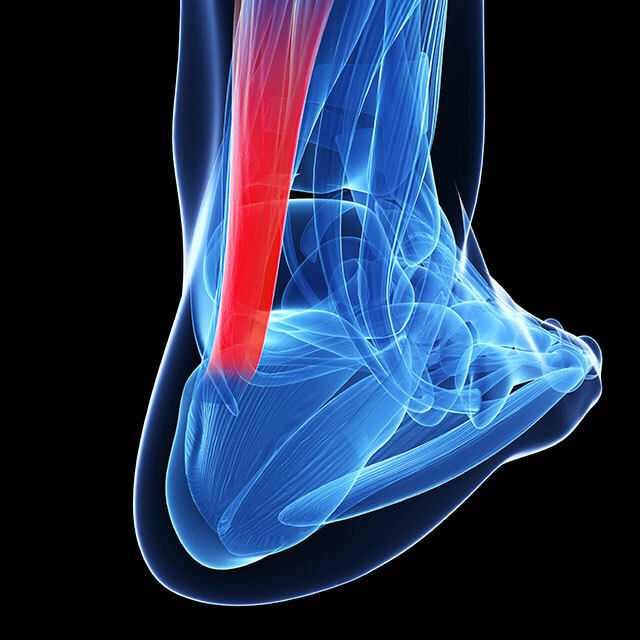 The Achilles tendon is the tendon connecting the calf muscles (gastrocnemius and soleus) to the heel. 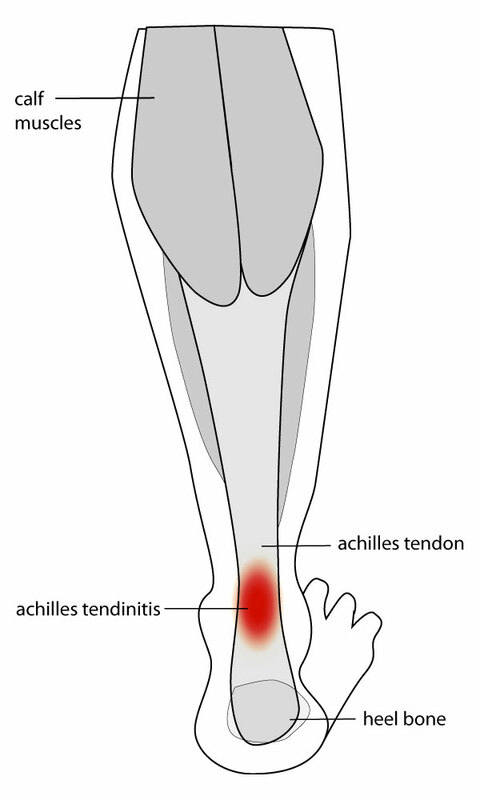 Its inflammation is called Achilles tendonitis. Inflammation is due to repetitive stress, which leads to micro-tears to the tendon. It can take up to 6 months to heal, and if left untreated can develop into severe degenerations and bone spurs, or rupture completely, requiring an operation and a much longer healing time. It is advisable to get professional help when the first signs appear. Differences in biomechanics of the runner's body (one foot might be flatter, or leg shorter; to adjust to these differences muscles have to work differently). Ice – Put ice pack on the affected area for up to 20 minutes when required, but stop if you feel anything strange, for example skin numbness. A bag of frozen peas wrapped in a cloth is a common tool for this, but I'd recommend the Hot/Cold Pack. 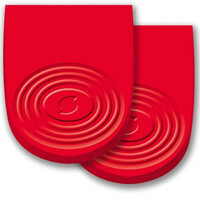 It offers more flexibility, as you can freeze or heat it as required. 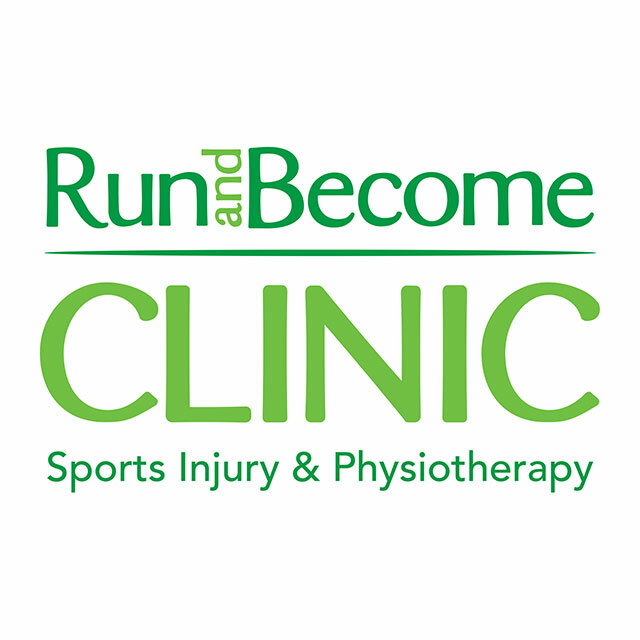 Rest - give the tendon time to heal, reduce running or stop completely. Anti-inflammatory - Painkillers like Ibuprofen will reduce the inflammation and pain, but avoid using them for long periods. Heel Pads - Placing these into your running shoes will lift the heel and reduce the impact and stress on heel, Achilles tendon and calf. You could try the Sorbothane Heel Pads. Operation - In the most severe cases (like Achilles tendon rapture) an operation will be required. Increase gradually - When increasing your running, distance or intensity, do it gradually (follow the 10% rule) and give the body time to adjust to the new amount before you start adding more. Cross-train - try swimming, Pilates, yoga, strengthening exercises. This helps to strengthen and stretch all the muscles for better flexibility, strength and balance. Alternating the running surface will also strengthen different muscles in the legs and feet. 1. Facing the wall take one step forward, leaving the back leg behind, feet flat on the floor. Put your hands against the wall in front of you, then bending them slowly, start leaning forward from the hips. The front leg bends in the knee, the back leg stays long and straight. 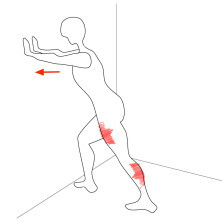 This will stretch the calf and hip flexor of your back leg. Don't forget the other leg! 2. 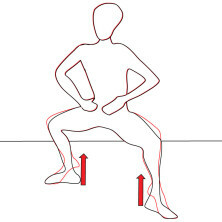 Facing a table, take a smaller step towards it, keeping the other leg behind. Bend your knees as if you were going to sit down, keeping more weight on the back leg and using the arms for support. 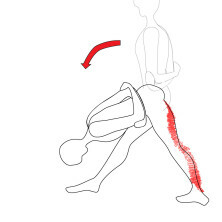 This will stretch the Achilles tendon of your back leg. 3. And one of my favorite torture stretches: standing straight, give yourself a hug behind your back, placing the hands on the opposite elbows. Take a step forward, keeping the other leg behind flat on the floor. With your legs straight slowly start to bend forward from the hips. This will nicely stretch the back of the leg. Note: Get into these stretching poses slowly, go as far until you feel the tightness and hold. Stretches should be held for 20-30 seconds (ideally 30). Again, listen to your body. Never force your body into anything uncomfortable or too painful. You are stretching to make running more fun, not to get another injury. 1. 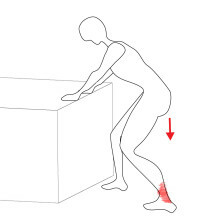 This exercise is recommended for calf and foot strengthening. Stand straight, one foot over the edge of the stairs, the other bent behind. 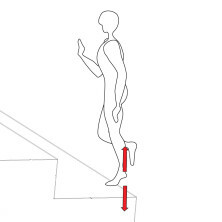 Make sure the forefoot and the heel of the foot on the stair are in one line. Support yourself with the arm on the wall, but do not lean against the wall. Slowly push your heel away upwards, and then lower it down. Repeat 8 times. If this feels comfortable, make a few repetitions. If you find balancing in this exercise difficult, start off simply standing on the floor and move to stairs whenever you are ready. 2. This exercise will work your calves, hams and glutes and more. 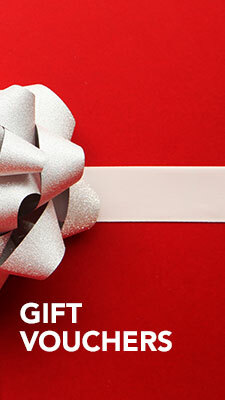 Hands on hips, take a step sideways, pointing your feet about 45º outwards. Bend your knees, making sure they stay above your heels and don't go out beyond. In this position, slowly push your heels away from the floor and then lower them. Remember, your hips stay at the same point. You are only lifting the heels, not the hips.